For the TV show, see Wagon Train. "Baggage train" redirects here. For the military use of the term, see Train (military). 1912 Pioneer Day re-enactment of a wagon train in Utah. A wagon train is a group of wagons traveling together. Before the extensive use of military vehicles, baggage trains followed an army with supplies and ammunition. In the American West, settlers traveling across the plains and mountain passes in covered wagons banded together for mutual assistance. Although wagon trains are associated with the Old West, the Trekboers of South Africa also traveled in caravans of covered wagons. Virtually all U.S. trails originated in Independence, Missouri, a gateway to the American West. 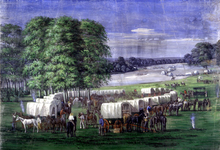 Perhaps the most famous wagon train trail was the Oregon Trail which had a span of over 2,000 miles. Other paths included the Santa Fe Trail, the Chisholm Trail, the California Trail (which split southwestward from the Oregon Trail), the Mormon Trail, and the Old Spanish Trail. Although "wagon train" suggests a line of wagons, when terrain permitted, wagons would often fan out and travel abreast to minimize the amount of dust blown onto other wagons. Originally, westward movement began in small groups, but well-funded travelers with a hundred or more wagons could employ professional wagon masters (or trail masters) and ostlers. Overland emigrants discovered smaller groups of twenty to forty wagons were more manageable than larger ones, especially without professional wagon masters. Many operated under democratic principles, creating bylaws and electing a captain. In reality, a captain had limited authority. His role was largely confined to getting everyone moving in the morning and selecting when and where to camp at night. 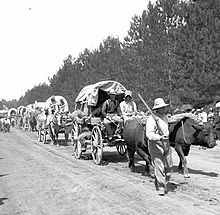 Membership in wagon trains was generally fluid and wagons frequently joined or left trains depending on the needs and wishes of their owners. An accident or illness, for instance, might force someone to fall behind and wait for the next train, or an emigrant might "whip up" to overtake a forward train after a quarrel. Some might break away to settle in Colorado Territory or other territories along the way. At night, wagon trains were often formed into a circle or square for shelter from wind or weather, and to corral the emigrants' animals in the center to prevent them from running away or being stolen by Native Americans. While Native Americans might attempt to raid horses under cover of darkness, they rarely attacked a train. Contrary to popular belief, wagons were seldom circled defensively. Today, covered wagon trains are used to give an authentic experience for those desiring to explore the West as it was in the days of the pioneers and other groups traveling before modern vehicles were invented. Indian teams hauling 60 miles to market the 1100 bushels of wheat raised by the school at Seger Colony, Oklahoma Territory, circa 1900. The advent of gunpowder warfare meant that an army could no longer rely solely on foraging in the surrounding countryside, and required a regular supply of munitions. In the 18th century, organized commissary and quartermaster departments were developed to centralize delivery of supplies. The delivery took the form of "baggage trains", large groups of wagons that traveled at the rear of the main army. Westward-bound collective treks are reflected in numerous books, films and television programs about the journeys. Examples include the several Westward Ho! titles, "Wagons West" by Dana Fuller Ross, James Cruze's silent film The Covered Wagon, Audie Murphy's Tumbleweed, and Ward Bond and John McIntire's Wagon Train series on NBC and later ABC. Stewart, George R. The California Trail: An Epic With Many Heroes. New York: McGraw-Hill, 1962. Unruh, John D., Jr. The Plains Across: The Overland Emigrants and the Trans-Mississippi West, 1840-60. Urbana: University of Illinois Press, 1993. "Life and Death on the Oregon Trail,Â Provisions for births and lethal circumstances,Â OCTA." Oregon-California Trails Association (OCTA) - Oregon Trail History. Oregon-California Trails Association, n.d. Web. 4 Oct. 2013. <http://www.octa-trails.org/learn/people_places/articles_life_death.php>. Brown, Dee Alexander, and Martin Ferdinand Schmitt. The American West. New York: Scribner, 1994. Print. ^ Brown, Dee Alexander, and Martin Ferdinand Schmitt. The American West. New York: Scribner, 1994. Print. ^ "Life and Death on the Oregon Trail, "Provisions for births and lethal circumstances", OCTA." Oregon-California Trails Association (OCTA) - Oregon Trail History. Oregon-California Trails Association, n.d. Web. 4 Oct. 2013. <http://www.octa-trails.org/learn/people_places/articles_life_death.php>. ^ Gregory, Leland (Jun 15, 2009). "Stupid History: Tales of Stupidity, Strangeness, and Mythconceptions Through the Ages". Andrews McMeel Publishing. p. 209. Retrieved 2 December 2013. ^ a b Huston, James A. (1991). Logistics of Liberty: American Services of Supply in the Revolutionary War and After. Newark: University of Delaware Press. pp. 15–18. ISBN 0-87413-381-5.